Seattle, circa the 1870’s, was a timberland boomtown. But even though business was good, logging camp operator Jason Bolt still had a problem—his men were getting mutinous. And not because of harsh conditions or unfair treatment either—but because there were no women! No women anywhere! If Jason wanted to hold onto his beloved land on Bridal Veil Mountain, and the logging camp thereon, he needed a plan. So, borrowing money from rival sawmill man Aaron Stempel, Jason sailed back to New Bedford, Massachusetts, and persuaded one hundred available girls to come back to Washington with him. Guided by their “straw boss” Candy Pruitt, the girls returned with Jason aboard a ramshackle ship, the "Shamus O'Flynn." The only catch in Stempel's money-lending proposition was this: if any of the one hundred girls left before a year’s time, Jason had to forfeit his land to Stempel. Of course, Stempel tried his darndest to make the girls miserable in their new home. 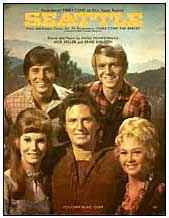 Based on the film Seven Brides for Seven Brothers, this Screen Gems sitcom launched the careers of many of its cast members. Bobby Sherman went on to become a popular recording star. Fair-haired David Soul, who certainly got more exposure on this show than he did in his earlier television gig as the hooded “mystery singer” on The Merv Griffin Show from 1966-67, would be reincarnated as “Hutch” on Starsky and Hutch. And he married, incidentally, one of the “brides” he met on the series’ set, actress Karen Carlson. She didn't leave within a year.